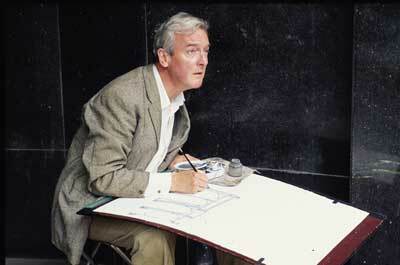 Glynn Boyd Harte at work on one of his watercolours of the development, photographed by Rob Moore. During the two and a half years of the development, Boyd Harte was a frequent visitor to the building site, always stylishly dressed, with or without hard hat and high-visibility vest. In this photograph he is sitting on the other side of Bow Street, opposite the Royal Opera House, while he captures the reconstruction of the Paul Hamlyn Hall, oblivious to everything except his work.